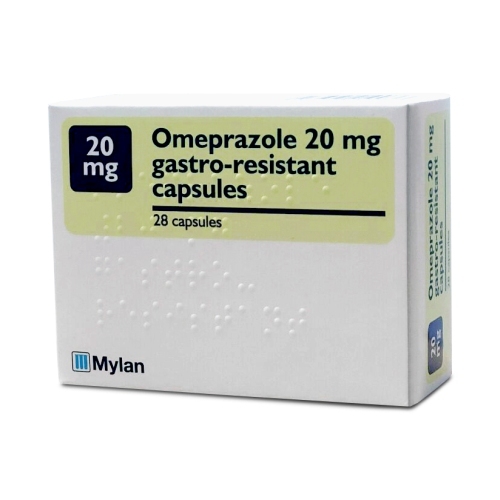 Omeprazole is a medication belonging to the “proton pump inhibitor” class. It is typically used to treat symptoms of GORD, also known as gastro-oesophageal reflux disease. This is when stomach acid travels up into the tube that connects the throat to the stomach, giving a burning sensation. It can also leave an unpleasant taste in the back of the throat, which can burn. Omeprazole is available to purchase over the counter at a lower dose of 10mg. If you want to buy omeprazole 20mg, you will need a prescription. This can be obtained from your doctor, or after completing an online medical consultation. Providing it is clinically suitable, a prescription is issued, and your medication is dispensed from our pharmacy. Your medication is then dispatched using a next day delivery service. Proton pumps located inside the stomach produce gastric acid in order to help digest food. Excess stomach acid produced can cause unpleasant side-effects for many people, and omeprazole works by reducing the amount of acid secreted by the proton pumps. This helps to relieve the effects of too much stomach acid, such as heartburn. Omeprazole also enables the food pipe to recover if it has been damaged by acid that has forced its way up into the throat. How do you take omeprazole? You should take omeprazole once daily in the morning, around 30 minutes before your breakfast. Swallow one capsule whole with a full glass of water. If you are taking any of these medications, you should consult your doctor before taking omeprazole. If you taking an antacid such as Gaviscon, Tums or Milk of Magnesia for indigestion or heartburn, you should leave a 2 hour gap in between both doses for each medication. Who should not use omeprazole? It may not necessarily be anything to worry about, but in these scenarios, it is best to be physically assessed by a doctor, who can rule out anything that could be hazardous to your health. If there is an underlying health issue that is causing acid reflux, omeprazole will only mask the symptoms, and not cure the problem. Can I use omeprazole if I am pregnant or breastfeeding? Omeprazole can be used safely in pregnancy, and only traces of omeprazole have been found in breastmilk, in quantities that are not known to be harmful to the baby. However, you should only take omeprazole under the supervision of a doctor if you are pregnant or breastfeeding. Why can I only buy one month’s worth of omeprazole? Taking omeprazole for a prolonged period of time can have an implication on other aspects of your health. Taking omeprazole for longer than a 3-month period can cause magnesium levels in your body to drop. This can cause you to feel low on energy, confused and light headed. Taking omeprazole for longer than one year can also increase the chances of getting a bone fracture or developing a gut infection. It can also cause vitamin B levels to fall. It is important to have a regular check-up with your doctor if you take omeprazole over a long period of time. If you wish to purchase more than a one month’s supply, our pharmacist may need to contact you to verify the status of your health. Does omeprazole make the contraceptive pill less effective? There are no interactions between omeprazole and any form of regular contraceptives. Omeprazole may make ellaOne (ulipristal), a form of emergency contraception, less effective. If you are taking omeprazole and wish to use the morning after pill, you should consider an alternative. Is it safe to consume alcohol with omeprazole? Alcohol has no direct impact on omeprazole, but drinking alcohol can cause your stomach to secrete more acid than normal. If you are suffering from acid reflux, it is recommended to avoid consuming alcohol, as it can make symptoms worse. You can safely order omeprazole online from our UK registered pharmacy. You will need to complete a medical consultation before you check out. This is so that our clinical team can assess whether or not it is safe for you to take. If it is safe for you to be prescribed with omeprazole, it will be dispensed and dispatched from our pharmacy, using a next day delivery service.